Finance is a field without borders, where capital can invest in and exit assets almost freely and instantly. For banks, it is important to attract long-term institutional investors for stability amid increasing volatility. To grab their attention, not only do chief executives have to show their financial companies are fundamentally strong in numbers, but also they need to be able to speak to investors in their language both casually and professionally. Everyone has a global mindset with a strong desire to be a digital innovator. But only a very few executives can communicate freely when traveling abroad to meet with potential investors in global financial hubs such as New York and Hong Kong, industry sources say. They are: Shinhan Financial Group Chairman & CEO Cho Yong-byoung and Woori Financial Group Chairman Sohn Tae-seung, the only "two true global communicators," industry sources say. Citibank Korea CEO Park Jin-hei is also a fluent English speaker. Between Sohn and Cho, Sohn is the only one who never needs a translator with professional knowledge in finance. He communicates directly with investors at meetings abroad, one of the sources said. Sohn's schedule for investor relations roadshows is going to get packed in 2019 as he is heading both Woori Bank and Woori Financial Group. This is in line with his goal to attract foreign institutional investors and increase their equity ownership in the group. Currently, foreign investors hold a 20 percent stake in the bank, which will transform into Woori Financial Group, with Woori Bank to be the flagship unit early 2019. "It's true. He doesn't ask his IR team to communicate with investors for him, even though his IR employees travel with him overseas," a Woori Bank spokesman said. He noted Woori seeks to increase foreign institutional ownership in the bank to 30 percent, given shares owned by the National Pension Service's 9 percent and the Korea Deposit Insurance Corp.'s 18 percent. A group of financial investors hold a 35 percent stake and employees have 5 percent. Shinhan Chairman Cho, meanwhile, can speak very casually. But when it comes to delivering important details concerning Shinhan Financial Group, the chairman would ask a translator so that "there wouldn't be any misunderstanding or misinterpretation," another source said. Cho and Sohn share a common background as both have experience running their companies' global operations. Cho was a senior managing director of Shinhan Bank's global business unit in 2009, after he was the head of Shinhan Bank's branch in New York. In March 2017, Cho became the Shinhan chairman. 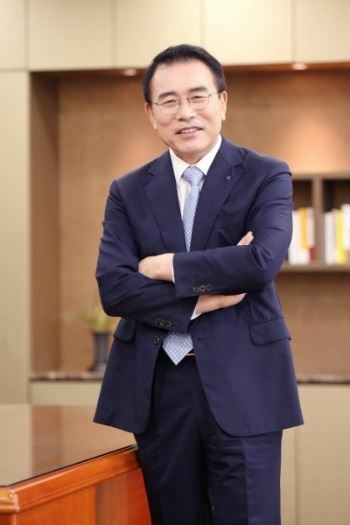 Before becoming Woori Bank's CEO in December 2017, Sohn headed the bank's global business for two years. They both also earned MBAs from Helsinki School of Economics and Business Administration, renamed Aalto University School of Business in Finland. Cho is two years senior to Sohn, who was born in 1959.